The logo that will introduce Irish track cycling to the American market; and the World Cycling League is pushing our riders pretty hard too. 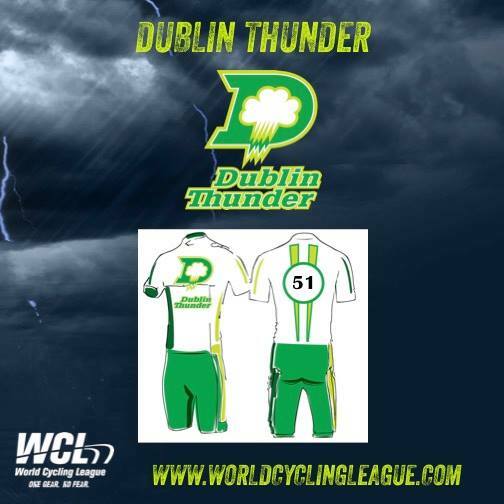 A couple of weeks ago we brought you news of the new Dublin Thunder track team and its plans to be part of the start-up World Cycling League in the US. And now the league, which intends to package track racing as a fast-paced entertaining team sport stateside, has released the first promotional material on the Irish team and its riders. And it’s pretty sweet to see the Irish being pushed in this way; with the Americans clearly looking to develop something of the “fighting Irish” vibe around our boys and girls. “The Irish have a long tradition of producing tough international cyclists like Sean Kelly and Stephen Roche, legends of the sport who put their small country on the global cycling map,” starts the description of Dublin Thunder on the World Cycling League’s website. A first glimpse at the kit Dublin Thunder will compete in when it lines out in California next month. 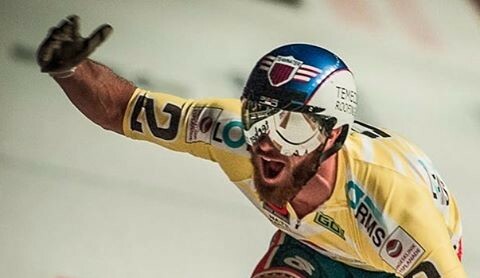 “Famous riders and the growing popularity of cycling throughout the country has stimulated interest in building Ireland‘s first indoor velodrome in – where else – Dublin; the home of the active Sundrive Velodrome, one of three outdoor tracks in the country. And there are profiles of each of the Irish riders also on the site, which we’ve published below. The Irish outfit will be one of just two from outside of the US in action at the first league showdown in Carson, California, on March 18th and 19th. One of the publicity shots for the new franchise, which is clearly trying to bring some US bling into track cycling. ‘Dublin Thunder’ will send a seven-strong team to the west coast of America to race a lucrative event the organisers are hopeful of transforming into something like the Bremen or Ghent six-day. A Mexican squad – Mexico Heat – is the only other team from outside the host nation, which will have four teams competing in the March meeting and future fixtures. The seven-rider Dublin Thunder team is Eoin Morton, Con Collis (both UCD CC), Fintan Ryan (Dunboyne), Eamonn Byrne, Lydia Gurley, Eimear Moran and Susie Mitchell (all Sundrive Track Team). To read a full profile on each rider and find out how the Americans are selling the Irish, just click on the images below.